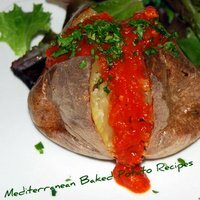 This baked potato recipe is perfect for all of us who want to lose weight using the principles of the Mediterranean diet. 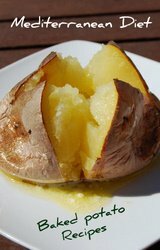 There is nothing like a crispy, crunchy baked potato (or jacket potato) straight out of the oven. Cut into it and the potato is fluffy and light. The combination of all of these textures is gorgeous. They make a great healthy option to go with any main course dish....or can be eaten on their own as a quick (and cheap), but satisfying meal with a variety of fillings. 2 large baking potatoes, well scrubbed. 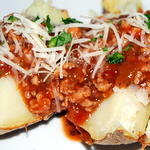 If there are any blemishes or black marks on the potatoes after they have been cleaned remove them with a sharp knife. Put them into the microwave on some kitchen paper and cook on high for 10 minutes. Smaller potatoes take less time. Using an oven glove transfer from the microwave to the top shelf of a pre set oven at 200ºc / 400ºf. Place an oven tray, lined with foil, underneath them to catch any cooking drips. Your potatoes are ready to serve immediately. Eat them straight away or the skin will go soft, but be careful as they will be are very hot. Serve them with your choice of main course, cut open with low fat creme fraiche or the equivalent....or you may like to treat yourself and put in a blob of butter! 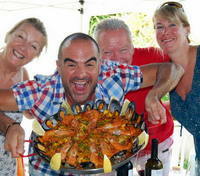 Or why not top them with some of our suggestions below, to make a really quick and economical meal. tomato sauce recipe....or zest it up with a little chilli. Or, why not try our arrabiata sauce for a spicy change. 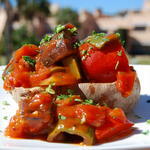 Stuff with some of our healthy ratatouille recipe. golden brown. 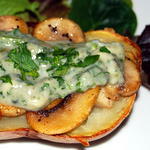 Make up a portion of our blue cheese and mushroom sauce, then pour onto the potato. of our pesto recipe. Then put it back into its skin and pop it under a hot grill for a few minutes. Fill with a mixture of low fat sour cream or equivalent, fresh chives and seasoning. coriander. Pile this mixture into your baked potato...delicious.